We very much value our relationships with our clients. Because we often represent people suffering horrible injuries and extensive medical care, our clients depend on us to help them through some of the most difficult times in their lives. 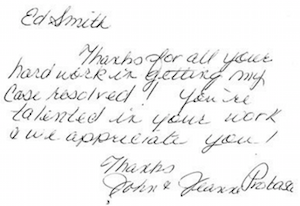 I recommend Edward Smith. Edward handled my Motorcycle Accident matter. I have previously worked with 3-5 lawyers. 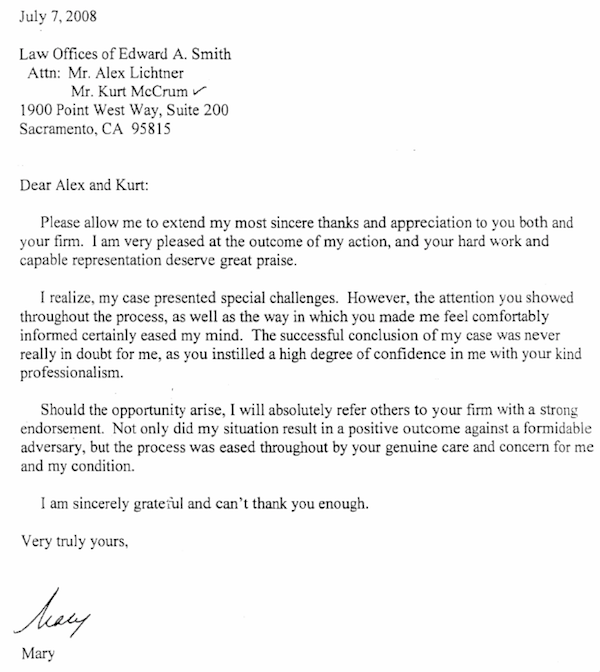 We were referred to the Edward Smith Law Offices by a lawyer friend who said they are the best...and he was right. 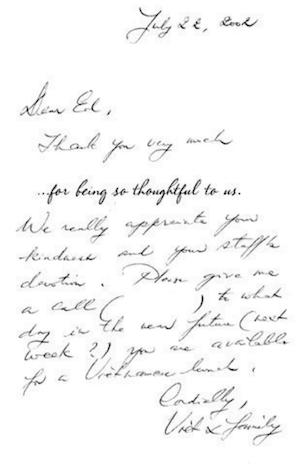 From the first time we met with Ed and Christine, we were treated with respect and compassion. All through the process we were kept informed of the progress of the case and what to expect next. We are very satisfied with the outcome and with the level of professionalism from everyone at the office. I just wanted to say thank you to everyone who has helped on my case the last 3 years. I appreciate all your hard work and effort. My deepest appreciation for all you did through the years as a wonderful law firm and, more importantly, as the wonderful people you are. Your commitment to help me, along with the added assistance, will now afford me the opportunity to focus my health issues that I could not otherwise afford. I am really not of the right words to say other than a true 'Thank You'." 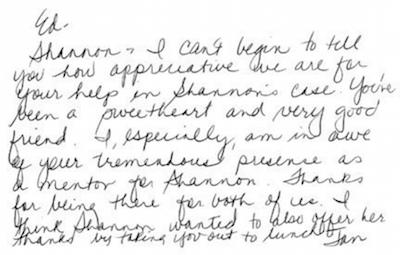 I can't begin to tell you how appreciative we are for your help in Shannon's case. You've been a sweetheart and very good friend. I especially am in awe of your tremendous presence as a mentor for Shannon. Thanks for being there for both of us. 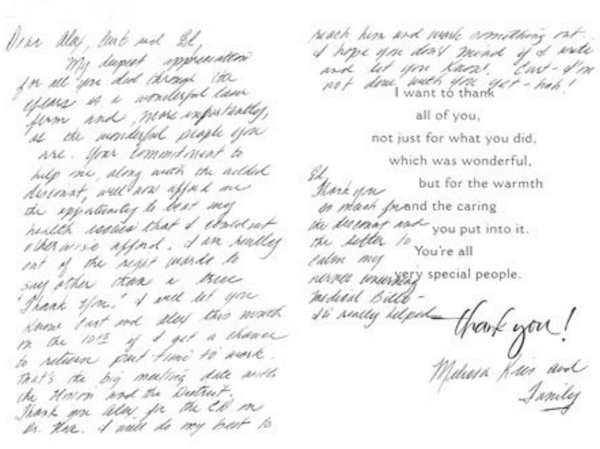 I think Shannon also wanted to offer her thanks by taking you out to lunch." Thank you so much for the kindness you showed me and my family. 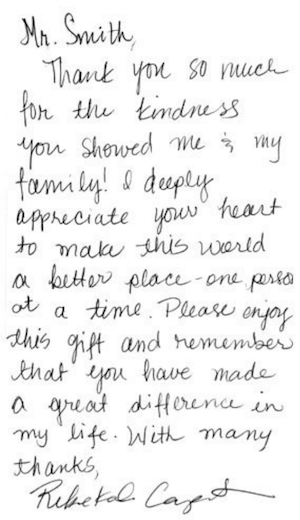 I deeply appreciate your heart to make this world a better place - one person at a time. Please enjoy this gift and remember that you have made a great difference in my life. Thanks for all your hard work in getting my case resolved! You're talented in your work and we appreciate you! - John and Jeanne P.
Thank you ver much. We really appreciate your kindness and your staff's devotion. Please give me a call to what day in the near future you are available for a Vietnamese lunch. Thank you so much for taking my case. There was always someone available to talk to when needed. 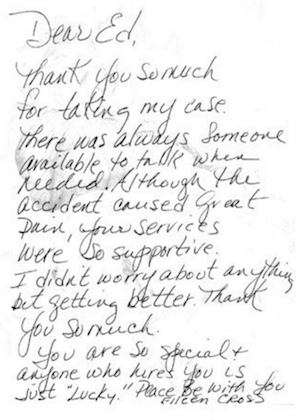 Although the accident caused great pain, your services were so supportive. I didn't worry about anything but getting better. Thank you so much. You are so special and anyone who hires you is just "lucky." 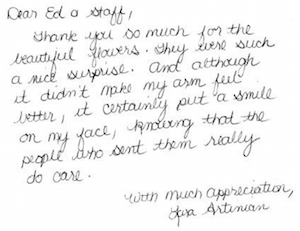 "Dear Ed & Staff, Thank you so much for the beautiful flowers. They were such a nice surprise and although it didn't make my arm feel better, it certainly put a smile on my face, knowing that the people who sent them really do care. 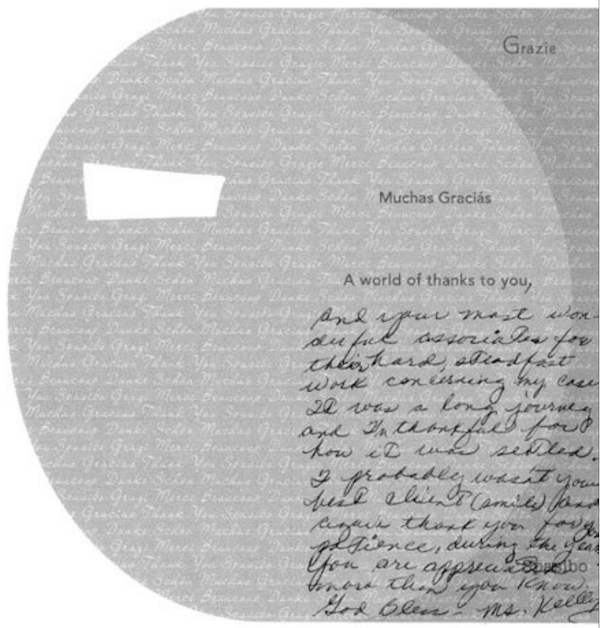 "A world of thanks to you, and your most wonderful associates for their hard, steadfast work concerning my case. It was a long journey and I'm thankful for how it was settled. I probably wasn't your best client (smile) and again thank you for your patience during the years. You are appreciated more than you know. Please allow me to extend my most sincere thanks and appreciation to you both and your firm. I am very pleased at the outcome of my action, and your hard work and capable representation deserve great praise. I realize, my case presented special challenges. However, the attention you showed throughout the process, as well as the way in which you made me feel comfortably informed certainly eased my mind. The successful conclusion of my case was never really in doubt for me, as you instilled a high degree of confidence in me with your kind professionalism. Should the opportunity arise, I will absolutely refer others to your firm with a strong endorsement. Not only did my situation result in a positive outcome against a formidable adversary, but the process was eased throughout by your genuine care and concern for me and my condition. I am sincerely grateful and can't thank you enough.